Google will definitely provide you with a wealth of information. However, in our experience it's too thorough. 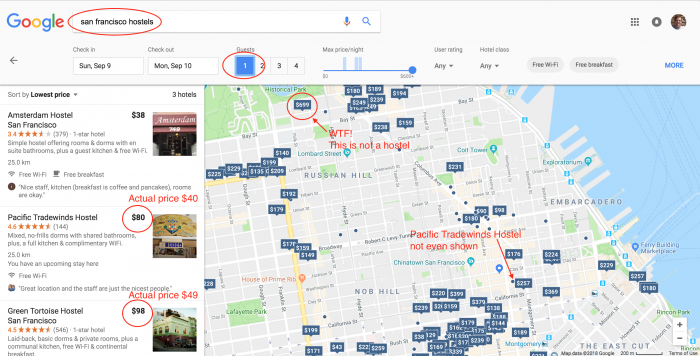 For example, if you do a Google map search for "San Francisco Hostels" you will see a huge list of results ranging from the cheapest hostel to expensive hotels at $699/night! I seems in Google's mind, the only difference between a hostel and a hotel is price. Of course, hostel travelers know hostels are nothing like hotels! Furthermore, Google's pricing is always off for hostels. This is because their policy is to quote for double occupancy for all properties. However, no one ever quotes a hostel price as being for two people! This just doesn't make any sense. We hope hostel travelers will complain to Google and let them know that if the search query includes "hostel" then single-occupancy pricing should be quoted by default. ‹ Can't I just use Hostelworld to find San Francisco hostels?